The U.S. stock market has been said to have lost $11 trillion in value and the net worth of the average American household is down 28% yet 65,000 people signed up to be informed when Poseidon Undersea Resorts start taking reservations! 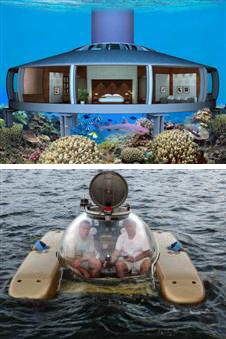 Now the same group which builds submarines for superyachts has reached an agreement with a buyer to build and install the world’s first sea floor residence and confirmed new orders for two Triton 3300/3s the luxury deep submersible capable of carrying three people to 3300 feet. Possibly the recession has plumbed new depths.